SOLDIER FIVE is an elite soldier's explosive memoir of his time within the Special Air Service (SAS) and, in particular, his experiences during the 1991 Gulf War. As a member of the Special Forces patrol now famously known by its call sign Bravo Two Zero, he and seven others were inserted hundreds of kilometres behind enemy lines. Their mission to reconnoitre targets, undertake surveillance of Scud missil sites and sabotage Iraqi communications links was to end in desperate failure.From the outset, the patrol was dogged by problems that contributed both directly and indirectly to the demise of the mission. The patrol's compromise, and subsequent attempts to evade Iraqi troops, resulted in four members of Bravo Two Zero being captured and a further three killed. One escaped. But the story goes further that the Gulf War itself. 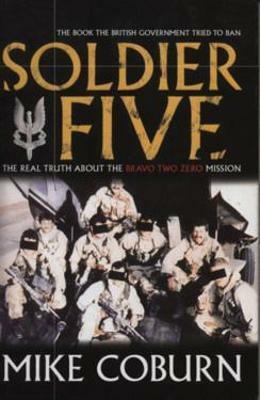 Despite numerous books, films and articles on the same subject, the British Government has done its utmost to thwart the release of SOLDIER FIVE, at one stage claiming the book in its entirety was confidential. A campaign of harassment that took some four and a half years of litigation to resolve has now resulted in this controversial publication. SOLDIER FIVE is a gripping and suspenseful account of one man's experiences as a Special Forces soldier. Revealing his conflicts and loyalties, and the relationships he forged both on and off the battlefield, this book is the resolution of a soldier's determined fight to see his story told.